‘…I remember a vision when I was doing a work with numbers during the night, and I was putting numbers – numbers and groups of numbers – I was putting them in certain positions… It was associated with groups of people who are all over, groups of people who are spread out in the world and connected with…what planet? Planets? At this point it is well to summarise the position on the ground. What exactly has been lost of the Sacred Vision in what was constructed in Auroville? 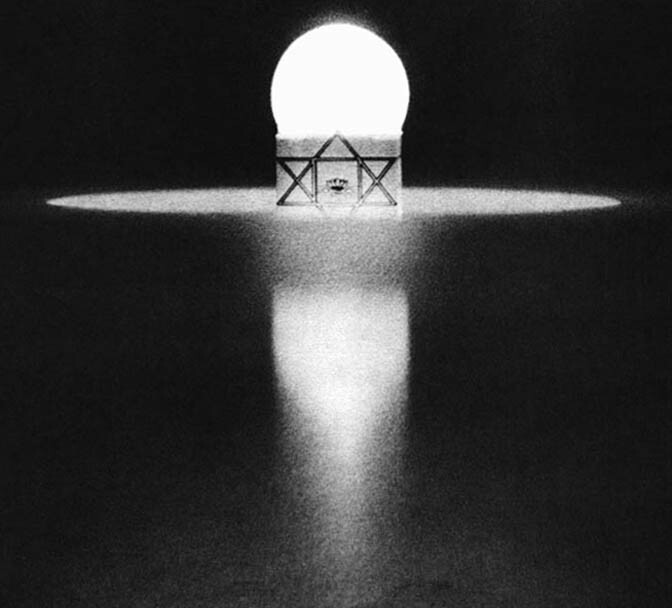 The 24-metre diameter does not exist; the 15.20m measure of the Ray does not exist; the 15-step entry from below into the floor of the chamber facing north does not exist; Sri Aurobindo’s symbol in the Shalagrama does not ‘exist’; the translucent Globe does not exist; the stone Pedestal does not exist. Is there anything then of gnostic significance and value in the structure? And even if only one or two items of the Vision have survived – such as the 12 columns – the fundamental feature proper to all great sacred art is absent: its unity. In these matters it is all or nothing. Unfortunately, for disciples and devotees of Sri Aurobindo and the Mother, they are left with nothing. But the Vision itself lives on; its Knowledge has been revealed and preserved. This is the focus of these Chronicles. One important factor must be borne in mind as we proceed: the descent of the Knowledge of the Mother’s Vision evolved pari passu with the Auroville construction. As one grew the other took shape. This does not mean that both are meant to stand side-by-side, offering forever after a choice to seekers. Yes, in the early stages the two must provide elements for the special Act of Choosing. But once the work is done, once the processes of Yoga are completed to ‘construct’ that Vision in all its gnostic splendour, the Shadow has no longer any reason for being. It served to provide the contained field, a delimited space where the poisonous fumes that were destined to arise from the acceleration of time could be contained, absorbed. This is the meaning of the Churning of the Ocean myth: Time, thus accelerated, gives off wastes; and these must be ‘consumed’ or ‘absorbed’ for the Earth. Until a new balance is reached, the forward drive is not yet in harmony with the alignment of consciousness of the species. More particularly, the new creation, which is to establish this new alignment, is just nearing the point where it can effect that harmonisation so as to avoid a global catastrophe. A signal of this overpowering imbalance due to acceleration is reflected in the ecological crisis the Earth faces. The accumulation of wastes affects all levels of being, down to the physical. On that level too, nothing will effectively change until the consciousness of the species secures this new alignment and balance. The fact that Auroville is the contained field to consume the waste of acceleration does not mean that there are no repercussions beyond when the temple’s measurements are not ‘perfect’, as the Mahamaya exhorts. When imperfect there will be repercussions on whatever is represented in the temple by the application of the Laws of Equivalence and Correspondence. We can demonstrate factually how this works in the Mother’s temple, and in the process reveal the area covered by the Mother’s Vision through these ancient formulations. Thus, as discussed in CIC 8, the translucent Globe measures 70cm diameter, which, by the Laws of Correspondence and Equivalence, encompass the total landmass of India as delineated by the nation’s astrological ruler, Capricorn. There has to be consistency in the Knowledge. We have seen how this zodiacal sign and its ruler, Saturn, are manifest throughout the temple. There cannot be a hodgepodge – something plucked from this school, something from another; or else one symbol, then another, and nothing linking the two. Consistency is the keyword. The Mother’s Vision has demonstrated an impeccable consistency: from whichever angle we approach the Knowledge we find the same unity of substance. This is the hallmark of a great revelation of Gnosis. In this Chronicle we will unveil even more astonishing proof of the Mother’s consistency and genius, citing her own words in describing her activities as the Supramental Shakti. In the Auroville Matrimandir the only consistency we find is the consistent lack of any higher content; added to this is the unfortunate fact that the building now standing at the heart of a township purported to be a creation of the Mother’s and the cradle of the Superman, bearing Sri Aurobindo’s name, consistently denies all that the Mother sought to capture in the temple. The Auroville Matrimandir is exactly what the community, the builders, the architects and the governing bodies desired it to be: no knowledge, no higher function and purpose, no truth-conscious unity. In fact, in the language of gnostic symbols, the Auroville Matrimandir is, as reported in CIC 8, a hymn to the Dark Lord. However, this is not a condition limited to Auroville. We find a woeful incompletion stamped on all the remaining parts of the Mother’s work; and if we have discussed the infirmities affecting Auroville in these Chronicles, we have to include the Ashram in our assessment because the two cannot be separated, though we might like to do so. The Mother’s decision to set the township on its way was not born of any mental formula. Like the moment when she redesigned Sri Aurobindo’s symbol, this too corresponded to a special threshold having been crossed in the destiny of the Supramental Manifestation. It was the time to extend the field (the Ashram) because that destiny had matured and the former laboratory could not support the new processes of Yoga that were to follow. This does not mean that the old field would cease to have relevance; it simply means that what it stood for could only find fulfilment when that extension had manifested in perfect synchronicity with Gnostic Time. As well, there had to be a ‘connecting link’ between the two, what we will call a bridge, in order to materialise the continued relevance of that former field. But that Bridge did not hold. The crossing could not be made to join the two. Given this statement by Sri Aurobindo in The Life Divine, are we to assume that the ‘symbol’ we are to realise is a tomb, and that this is the future of the new creation? Or is the sacred Samadhi simply a reminder of the path yet to be tread, as Nolini Kanta Gupta stated at the time of the Mother’s passing, to the effect that hers was ‘the old body’, and the ‘new body’ would come? Then there is the more significant question of the relics that are sent out into the world to further cement this symbol-message: dead substances such as nail clippings and hairs of Sri Aurobindo. These are then housed in miniature Samadhis outside the Ashram for devotees to worship. However much we may admire the devotion of devotees farther afield, these structures house dead relics. Certainly if we accept that the Supramental Creation and its special gnosis are unlike anything the Earth has known, then we have to admit that while a Samadhi may be acceptable in all other ashrams as the proper focus for concentration, in Sri Aurobindo’s Ashram it stands as an aberration similar to the cross of Christianity – also a symbol of the victory of Death. Surely when given deep thought the Supramental Manifestation was not destined to follow that old way. What then is the answer? Time had to be fulfilled before anything of that new creation could become established. 1971 was the demarcating threshold; and the key to that new future lay in the Mother’s consciousness. It was the work Sri Aurobindo left for her to complete after his passing. The Mother’s Vision reveals the new way of the Supermind for this new Age and makes connected sense of all the existing ‘fields’ of the Work. But the problem exists that while the Ashram clings to a samadhi as its cherished symbol, in Auroville that revelation was decimated after barely 18 days. And without that Vision the mission of Sri Aurobindo has no future. We must remain content with a tomb on one end and a vacant eulogy to the Dark Lord on the other. In both situations Death triumphs. The bridge linking the two and making sense of the continued existence of these centres is the Gnosis, the supramental Light that emanates from the Mother’s Vision and that is symbolised in the Globe of her chamber. Therefore it is ‘the symbol of the future realisation’, as she has stated in The Matrimandir Talks. The Mother’s original plan is her legacy, her map to guide us into that new Future. Without that map, just as revealed and recorded during those 18-days, we cannot reach the other shore of Time and thus experience integration. Without that integration ‘gaps’ remain, seepages of energy, and the road to Immortality is barred. For to reach that luminous shore we must cross the Bridge of Gnosis. As the symbol being the thing symbolised and ‘to be realised’, Sri Aurobindo wrote, we understand that the visual impact of the chamber is our guide because it reveals the new way: an inward, concentrated convergence onto a central Point. This sacred-most point is the great secret of the Core. The Mother has left seekers in search of this Light with all the details of the new Yoga that would safely and surely set us upon that path. We understand then that the destiny of the Supramental Manifestation is a thing decreed and cannot be arrested in its flowering on Earth. If the Auroville Matrimandir is an aberration, it is a controlled device to serve the divine Purpose of the One. However, only when that Bridge opens up before us and we make the crossing to the new future that the Mother’s Vision foretells, can any sense be made of these aberrations. Without that Bridge illuminating the passage before us, both centres of the Mother’s work are as if orphaned. In the Ashram we have a secure abode of the comforting ‘Mother’ (without the article ‘the’) who pins us to the past. In Auroville we have the chaos that a centreless structure engenders, which cannot support the edifice of a new creation. The best way to understand the issues involved is by seeing these laboratories, or fields, on the backdrop of Time. This could not be done before the 1960s – perhaps the real beginning was 1956, the year of the Supramental Manifestation. From then on we can turn to Time for indications. As the keeper and fulfiller of Destiny, Time can reveal in a dispassionate and factual manner what nothing else can. When ‘time is fulfilled’ – that is, when a certain maturity is reached in a supramental process – we can begin to measure the process on the backdrop of a specific ‘formula’. This formula is revealed in Sri Aurobindo’s symbol. It is the formula his higher consciousness knew existed but which he laboured in the final years of his life to bring down. As we will observe, Gnostic Time – the utilisation of Time as ally and not destroyer – has been ever present in not only the workings of this particular destiny but in the whole world. However, it is a fact that this very special ‘aid’, as Sri Aurobindo called Time in his The Synthesis of Yoga, can only unveil itself once this maturity is reached. This means that a new base must come into existence, an appropriate horizontal plane. That plane has to be able to sustain or support the Vertical Axis; in this case, that Vertical contains the operations of Time in a gnostic process involving the integrated fields (of the Horizontal). On this basis, considering that the Ashram and Auroville are the fields constituting the horizontal plane, Time can then reveal the function or placement of both once this maturity is reached. Each thing is then seen in its rightful place within the whole. In so doing, the condition of the Mother’s work is made factually clear. Thus, the Ashram in the integrated field is the Past; Auroville (in the same field) is the Future. But they are not connected; hence we have the situation described above with the Ashram closed within the secure castle walls of ‘Mother’ (without the article); while Auroville abides in a chaos of undefined ‘possibilities’ so clearly demonstrated in the centre of its community’s life. Being cut off and without a connecting bridge, the City expresses the void that stands at its centre: no purpose, no higher function, and above all, no focus. That focus is the topic of this and the remaining Chronicles. It cannot be feigned, it cannot be the result of a computer programme, think tank deliberations, the plans and projects of governing boards, and certainly not a result of government policy. It is provided only by the Core of the Mother’s chamber. Presently this key element is non-existent. Therefore there is no holding power for the township. In practical terms what this means is that Auroville’s future, disconnected as the township is from that new base, is simply what it is for ordinary humanity: a jumble of possibilities and mostly unrealisable potentials. Today one thread of those multitude of possibilities is taken up, tomorrow another. Having lost its connection to the Ashram at the time it rejected the Mother’s Vision in the 1970s, it could only tumble into the waiting arms of the Government and must abide now by the preferences and goals of political parties. A supramental focus of purpose is lacking whereby no such experimentation with destiny, if it may be so called, takes place. The future would be ordered, made a cosmos, responding to higher laws and patterns of destiny – indeed, the highest known to humanity for many thousands of years. In such a condition there is never any waste and never a residue. This is the application of Supermind in that integrated field. The symbol of the Sun provides an exact description (see CIC 7). On the basis of this symbol we learn that Point and Circle are one, harmonised, each dependent on the other. Boundaries are known and accepted, as in a true cosmos. It can be macrocosmic, like our own solar system. It can be microcosmic, like each individual component within that system. The important factor is that the PERFECT CENTRE exists, the CENTRE THAT HOLDS. And so, on one edge of the chasm there is the Ashram that is locked in its glorious past and afflicted by a complacent, indulgent Tamas that such a situation engenders. It therefore experiences no growth and is unable to apply its store of wisdom, power and experience because that extended field is not integrated into a single unified base where that Past can find its rightful place and contribute to the flowering of the new creation. It is thus trapped in the parameters of the old field, in an incomplete system, prisoner of the old way. On the other side of the chasm there is the inchoate future, caught in the bind of a vehement blinding Rajas. The balancing power of Sattwa (the present) is absent. In this ruler of Gnostic Time, with the Ashram as the Past and Auroville the Future, the Bridge that alone can connect and integrate the two is the Present. Thus, there is no power of the Present in action in this truncated process, which implies an actualising force on Earth. Both communities have rejected that connecting Bridge – the City by rejecting the Mother’s Vision in 1970, and the Ashram by doing the same when in 1978 it rejected the only book in the world where that very Vision and its temple were ‘constructed’ – read, preserved. This was the contingency plan since the Auroville community had made its choice to adopt the Troika model (see CIC 2). The Mother’s Vision could not be allowed to perish. But the same forces that dismissed her Plan also set upon the Book, undeniably in an affront to Saraswati reminiscent of the Inquisition. To compound the matter, the same press that shredded this already printed Book to pieces, where the only record of the Mother’s sacred Vision and its knowledge content was preserved, readily published the gibberish contained in A House for the Third Millennium, with Lohman’s banal interpretation of inside-outside/upside-down consciousness and fourth dimensional measuring! (See CIC 4). Indeed, there was an identical , predictable response to the Vision on both ‘shores of time’. The new base must be constituted by these three elements, which are represented by Gnostic Time as Past (the Ashram), Present (the Bridge), Future (the City). This describes an integral field. In terms of number-power, by which means we can APPLY the formula, they are 9 (the future), 6 (the past), and 3 (the present). This is the formula Sri Aurobindo left for us to discover and apply. It is given in his very own symbol, in the Supramental Square which holds the sacred Lotus of the Avatar: a top row of 9 petals, then 6, then 3 upholding leaves. There has never been any mystery, really speaking; Sri Aurobindo and the Mother always knew the formula, otherwise it would not have been incorporated in such a prominent position in the symbology of their work. But the point is its application; for indeed it was only after Sri Aurobindo’s passing in that critical year of the Name and the Pedestal, 1950, that this gnostic formula could be applied because all the ‘gaps’ were filled. Time was made whole. In terms of the application of the Knowledge, Time could then be the ally. To illustrate how all this works and the consistency and coherency of the Supermind with its ‘super logic’, we shall quote the Mother herself on her action as the Supramental Shakti, confided to her disciple, Satprem, on 5 February 1969. After this dialogue appeared in L’Agenda de Mère (1981) for the first time, it became the focal point of an article entitled, The Supramental Change, featured in ‘The Vishaal Newsletter’, 0/1, October 1985. The topic of that article with this particular dialogue was precisely the question of a ‘bridge’ forming a link. But in that treatment it was from plane to plane, rather than field to field. However, the function of the Bridge is the same in both instances: to apply the laws and principles of Supermind to life on Earth, through the creative activity of the Supramental Shakti. Without that Bridge the reader will note in the following excerpts that no coherency, sense or logic can be made of the Mother’s experience, even though she took such pains to have it recorded in detail. But with the revelations that resulted from the Mother’s ‘sorting out’ process, we are obliged to bow down before her in awe of her extraordinary faculties and the wonder and majesty of it all. Above all, we are ever grateful for having been privileged to bear witness to her extraordinary creative genius. In this dialogue, the Mother describes with remarkable accuracy how the Supermind is ‘organised for Earth use’ in the unfolding of the Supramental Manifestation, which was, in fact, the work Sri Aurobindo left for her to carry out. But we will see how, similar to her inner chamber and the precision of its plan, no one in her entourage took her seriously. Truly remarkable is that in spite of the fact that the Mother revealed to Satprem her astonishing capacity as the Supramental Shakti, involving NUMBERS and a very special ORDER and PRECISION, this very same person a year later seems to have forgotten her confidences entirely and discarded those numbers she then applied in her chamber plan as meaningless! Having already revealed the role of number, order, precision, to him, and having explicitly stated that this was the action of the Supermind, as the following will reveal, are we wrong in surmising that she believed she had an ally at least in this person? But what a shock lay ahead when not one person came forward and responded to her call. She had to turn elsewhere, to those far-flung corners of the globe that she describes in the following dialogue, to those special people with whom she was already then carrying out that detailed work on a regular basis, beyond the confines of both the Ashram and Auroville. Because of its connection to the descent of the Vision, we are obliged to reproduce her description in full to prove the point. Any sincere and unbiased reader can verify that the ‘ordering of numbers’ the Mother was engaged in is exactly the shape the Knowledge took in the form of a new cosmology which would be the key to the masterpiece of sacred geometry and architecture she would bequeath to the world almost exactly one year later. Especially significant to note is that she was commanded to tell the disciple of this special activity and have the experience recorded for posterity, particularly for those people she was ‘sorting out’, so as to verify the Knowledge and its source. We need to be grateful that these recordings were made and preserved. (In the following, only the irrelevant and distracting input from the Mother’s interlocutor has been left out; however, the full text is available in L’Agenda de Mère, Vol. 10, Institut de Reserches Evolutives, Paris, 1981. The bold type is our emphasis of salient points to note, which are discussed further on in this Chronicle and will be taken up in future Chronicles). …I remember a vision when I was doing a work with numbers during the night, and I was putting numbers – numbers and groups of numbers – I was putting them in certain positions. And that is what I wanted to tell you. In the ‘dream’ (if one can call it a dream), I told myself that I should show you this. All that is there [the Mother makes a gesture behind her head to indicate a memory there], it is there somewhere. And it is in connection with groups of people who are in different parts of the Earth. It is… well…it was the ‘numbered’ expression – the numbered expression of the application to life in a coming realisation: life to come, but not very far away; for example, in the next century which is beginning now. So this is what probably stayed in my memory and which was the reason why I wanted to tell you something. But I still see the arrangements of numbers. I spent a long, long time arranging them. A long time. A truer application, more universal, and with spiritual knowledge; the principle of the position (place) and the utilisation of individuals on earth. Two columns here, one column there; but living columns. It was not on paper – it was in the air. I don’t know how to explain this: it was in the air, and these numbers were LIVING, it was not writing on paper. And there were groups of numbers [the Mother tries to remember]. Yes, there were groups of numbers; those of one were blue, dark blue, and the others were golden yellow. And (how to put it? ), It was not masculine-feminine, but these were two principles, the two principles - the principle - not of creation but of conception (origination) [gesture of a descent from above] and the principle of realisation. I am completely conscious when I do this. I am asleep as it were, but I am not sleeping; and I am not ‘dreaming’: I DO, I ACT, and I am completely conscious, the same type of consciousness as in the waking state – not that of dreaming. I do that, and I was explaining to you how all these numbers were organised and that they determine future events. When I wake up, or rather when I get up (I can’t say ‘wake up’), when I get up and begin my activities, it goes – it just ‘goes’, not that it stops: that stays in the world. And it is only because you are present now that the contact with that memory is made. This lasted for several hours. It was not the ‘conception’ of a work: it was THE WORK itself. It was as if …as when there are levers and the things that one moves, and that sets in motion [the Mother outlines a large control panel] …It was something like that but it was not at all that! It was the organization of groups of numbers which determined the events and the ORDER of events (above all the order of events) and the place on earth. And probably while I was doing this, there was something that wanted me to tell you and which left this impression that there was something to tell you, but then it was all gone. When I come back to this life here, everything goes. It is only because now I searched that I made the connection [gesture of contact with that memory]. I searched and it has come back. But I realise, almost surprisingly, that this must have lasted at least two or more hours – two, two and a half hours. I don’t sleep at all, but I am active, thoroughly active in the… [the Mother tries to place the zone]…in what is being prepared to manifest on Earth. That is I don’t know if we must call it the ‘subtle physical’ or … It is the creative zone of the physical. And since I cannot run about from one place to another, what I do is connected to numbers like this – living numbers. Living numbers: I organize them, I put them in groups, and I remember what I did the night before and then I say: ‘No, yesterday it was like that, but now it is necessary that it be like this’, -- with the knowledge that tomorrow another change will be necessary. And it is this that determines the events. But the consciousness (the waking consciousness, or the ordinary consciousness) MUST NOT know what is decided there. I must only know the part that is necessary for the execution, and this is why there is a severance – it stays, it continues to live on like that [gesture behind the head] but it doesn’t come through. It is only because I had taken the decision to speak to you about it (in the ‘dream’) that I could make a connection with the memory of it, but …though I SEE – now I see those numbers, it is for this reason that I can describe them – it has no longer any meaning for me. And I don’t know if they are numbers or letters... it was numbers, I know it was numbers; there were golden numbers and blue numbers (but these are not our material colour). I was arranging them, I put a group there like this, another one this way [gesture like moving a puzzle], then I would choose. It is curious. And I must have been very large because the numbers were large. I would take them and place them on this big surface. And as I placed them a communication was made and that organised the events immediately to transpire. Last night – I knew I did it every night – but last night … there was (in the body), in the waking state yesterday, a sort of aspiration to know what the functioning, the action of the Superman Consciousness would be. I said: ‘It is not enough to have that Consciousness around one (like a rampart). It is necessary to know what the changes will be in the body’s functions, in the work and the method of the work. And then this experience (of the numbers) was a reply to teach me a bit how it is going to be. But it is curious, I was doing this just like they now do with certain large electronic machines, with all sorts of levers. I was doing it in this manner: I was moving them about … Only I think I must have been bigger…I don’t know. In any case, I placed the objects, it was something… but it was something fixed in form – it was fixed – and there was a sort of storage place (I don’t know how to say it), a storage place where I laid these things. Then I placed them in the arrangement like that. The arrangement in its wholeness was a continuity, but within which the details changed. If I remember exactly it will be interesting. I was making comments to you now and then, and I was saying: ‘These numbers (but I wasn’t calling them numbers, I don’t know…) this I am putting here because of that…’. I was giving you explanations. It must be an activity of the Consciousness (of the Superman) because it was not something that I have had for very long. Last night, I knew I was doing it regularly each night, but not since very long. This must have come with that Consciousness [the arrival of the Superman Consciousness, 1.1.1969]. This vision was like the application of certain scientific means (the large panel to begin with), but completely different! And it was based solely on … There was no thought, no reasoning, nothing of that: it was a force that acted like this [gesture of a descent that imposes itself], as it always does. And this force made one act. No, I was seeing, I knew that it was necessary to do that, and I wasn’t thinking at all, but I could explain why. That is, I could say in advance this was for this thing. And it was the combination of those two colours of numbers (perhaps it is a translation of my consciousness, but anyway…), blue and golden numbers. And the priority for action was always with the golden numbers, while the blue ones came as if to fill in the holes. This had form. It had a form. It is strange, it was so natural, so spontaneous, so HABITUAL: there was nothing in the being that remembered with astonishment, that is to say, it did not remember as one remembers a dream or to have done something – nothing of that. It was completely natural: I did it ‘like that’, and I knew very well that I did it every night, between midnight and three in the morning (a bit before, a bit later). But this has a very strong action. That is, it COMMANDS action on the Earth; but it is not submissive, tied to something below that holds it: It is like this [a gesture of a descent that imposes itself]. This constantly received the Will and the Power of action from above – not ‘from above’, it is not above, it is … [the Mother makes a sort of gesture signifying that it is ‘everywhere inside’]…‘superior’ in the true sense of the word. This was indeed the beginning of something ‘interesting’, for in the above the Mother describes with astonishing accuracy just how the Supermind is organised for application on Earth. In every way her explanation of these night time activities has been confirmed by the Knowledge that subsequently descended, when she started ‘sorting out the people’ after rejection of her Vision that was based on these NUMBERS and that special ORDER. Above all, and this is the most precious part, she notes that the action was not ‘from above’ but ‘superior’ in that it works from within everything, or from the perfect centre. Remarkably, this described the gnostic Core of her chamber that was to be revealed the following year. In the formula 9/6/3/0 they form the basis of the two ‘columns’ the Mother describes. In an astonishing display of APPLICATION, by the new cosmology we are able to link the formula to the calendar; and through this linkage we can connect these special numbers to a series of births; indeed they are thus ‘living’ powers. In the new cosmology there are, in fact, TWO columns that are called LINES. One is described by the Mother as ‘dark blue’, the other as ‘golden yellow’. By making use of colour, the Mother transmitted to Satprem the ‘essence’ of the columns/lines: the former refers to the Lunar Line (the dark blue of night), the latter to the Solar (the golden of the daytime Sun). But we must bear fully in mind that this cosmology was completed a number of years before anything of this dialogue was published. Can there be a better example of her action to ‘sort out the people’ than this? Her astonishing capacity to apply the Supermind attains unimaginable heights. She even refers to ‘planets’, but true to the subsequent Knowledge, she notes that though there is a connection, she is not so sure how it works. This is because though the Lines are ‘solar’ and ‘lunar’, these celestial designations do not really refer to planetary influences of the old school. They refer to the action of the respective columns/lines: inspirational, actualising; or, as she stated, conceptual and realising. She goes further and states that they do not refer to masculine and feminine – indeed, as one would attribute to the Sun and the Moon respectively in the old school. This recorded talk confirms everything contained in the new cosmology and which forms the basis of the Knowledge of the Mother’s Temple. And yet, the ‘wisemen and women’ will continue to deny what the Mother herself affirms repeatedly. Through these Chronicles we feel that finally the Mother’s extraordinary Vision has been vindicated. However, what would be the lasting effect of the Mother’s description of her work with numbers as the Supramental Shakti if the ‘sorting out’ had not born results and the Bridge had not come into being with its supramental Gnosis to connect the fields in the present? Could any sense at all have been made of her words? The disciple certainly did not take her seriously or he would not have dismantled her subsequent vision of the Inner Chamber; nor would he have been able to dismiss ‘centimetres’ and ‘astrology’ so lightly and favour an exaltation of the ego of the instrument, if at all he had REALISED what the Mother was describing. She explicitly stated what her activity was: the action of the Supermind APPLIED through numbers and the ordering process. What more should have been needed? It is essential to understand that the Mother’s task was not to give out the new Knowledge that explains her activity as the Supramental Shakti, or else the contents of her inner chamber. That was not her task. She herself makes this very clear (‘…But the…waking consciousness must not KNOW what is decided there. I must only know the part that is necessary for the execution…’). Her ‘field’ was the Ashram not the Bridge, where we find those explanations in the present. Of course the point need not be laboured that what the Mother relates is somewhat unusual, even bizarre. But let us imagine a different scenario. Let us reverse roles. What if Sri Aurobindo had had the above experience? How would it have been received? We may go further and question, What if the chamber plan had come through Sri Aurobindo? Would his entourage have dared to treat that Vision with the same indifference, disrespect and disbelief that the Mother experienced? We all know the answer (though we also know that certain disciples were impertinent enough to question passages in Savitri, to which the Mother herself took exception). The answer is Sri Aurobindo had the right gender and skin colour. Because of that the Vedic content we are revealing in these Chronicles, and prior to MAC in numerous other publications, would have been upheld as sacrosanct rather than rubbished by disciples who had no preparation whatsoever to deal with numbers and astrology and Vedic sciences. These ‘wisemen’ were quick to trash them all, even when the Mother had placed her full seal and sanction on the connection they bear to the operations of the Superman Consciousness, as explicitly revealed in the above dialogue. There has always been a phenomenal consistency and coherency in the experiences the Mother was having through the years following the Supramental Manifestation. The problem lay in the disciples she was addressing who had their own ideas and preferred to discard hers without making any effort to understand just what this 90-year old Seer was talking about. She was treated as one often finds the aged treated: she was humoured. The result is the centreless Void that stands at the heart of Auroville, and the ‘symbol-goal’ the Ashram offers as the finality of the quest. Disconnected, lacking integration, none of that is the Truth-Consciousness, the luminous Gnosis.